Introduction to the conference; some remarks on the conformation and dynamics of a single chain (W.H. Stockmayer). Polymer chain dynamics: the helical wormlike chain (H. Yamakawa). Molecular conformation and intrinsic viscosity of polyelectrolyte in the presence of added-salt (M. Nagasawa). Dynamic light scattering from polymer solutions (G.D. Patterson, G.C. Berry). Applicability of the scaling concepts to thermodynamic and viscoelastic properties of polymer solutions (I. Noda). Polymer self-diffusion and tracer diffusion in condensed systems (H. Yu). Polymer conformation in deformed systems. Observation by neutron scattering (G. Jannink, F. Boue). Dynamics of polymers in blends (M. Doi). Viscoelasticity and diffusion in entangled polymer melts (W.W. Graessley). Non-linear viscoelasticity and polymer chain entanglement (K. Osaki). Mechanical instability of swelling gels (T. Tanaka et al.). Dynamics of phase separation in binary polymer mixtures (Ch.C. Han). Kinetics of polymer/polymer interdiffusion (F. Brochard-Wyart). Morphology control through phase transitions in two-component polymer systems (T. Hashimoto et al.). Theory of block copolymer-homopolymer blends (J. Noolandi, T.A. Kavassalis). Some dynamical features of adsorbed polymers (P.G. de Gennes). Surface forces with adsorbed and grafted polymers (J. Klein). Layer thickness of macromolecules adsorbed on surfaces (A. Takahashi). Macromolecular materials possess some remarkable features arising from the fact that their molecules are made up of more or less flexible chains which can have various conformations. The study of molecular conformations and dynamics of macromolecules is important in polymer science and technology from both basic and practical viewpoints. In practice, these studies have concentrated on dilute solutions but more recently there has been a clear trend towards studying molecular properties in condensed systems in order to understand the entire macromolecular system based on a unified concept. 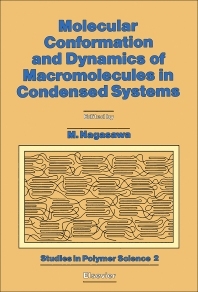 Based on lectures presented by an internationally recognized group of polymer scientists at a meeting held in Japan in October 1987 (plus two additional contributions), this volume summarises present knowledge of molecular conformations and dynamics of macromolecules from dilute solutions to various condensed systems. The book is not a random collection of papers of the usual conference proceedings type. Authors prepared their contributions in line with an overall plan for the work, were able to discuss the content with colleagues at the meeting, and finalised their text after the conference. It is thus a comprehensive, integrated overview of the field. Current developments in both theory and experiment are discussed in a well-balanced way. The behaviour of macromolecules at phase transition and interface is discussed in relation to their behaviour in bulk systems. The book offers a particularly up-to-date and authoritative picture of the current state of the art, and will be of interest to all research and professional workers concerned with polymer science in universities, industry, and government institutions.